* The inclusion of Western Sahara in the U.N. list is highly controversial, as the territory is currently administered by Morocco but is also claimed by the Polisario Front. Northern Africa is not to be confused with North Africa, whose definition is highly disputed but from the political standpoint is often limited to the four modern countries of Morocco, Algeria, Tunisia, and Libya. Within Northern Africa lies the smaller region known as Maghreb, consisting of Morocco, Algeria, and Tunisia and known in French colonial times as Afrique du Nord. The inhabitants of Northern Africa are generally divided in a manner roughly corresponding to the principal geographic regions: The Maghreb, the Nile Valley, and the Sahara. Northwest Africa on the whole is believed to have been inhabited by Berbers since the beginning of recorded history, while the eastern part of Northern Africa has been home to the Egyptians, Abyssinians (Ethiopians), and Nubians (Sudanic descent), although ancient Egyptians record extensive contact in their Western desert with peoples that appear to have been Berber or proto-Berber. Following the Muslim-Arab conquest in the seventh century C.E., the region underwent a process of Arabization and Islamization that has defined its cultural landscape ever since. Questions of ethnic identity usually rely on an affiliation with Arabism and/or Islam, or with indigenous cultures and religions. Northern Africans exhibit a wide range of phenotypical characteristics from fair to dark-complexioned. There has been an assimilation of these peoples of varying descent through their long history of intermarriage and cultural exchange. Northern Africa is separated from the rest of the continent by the Atlas Mountains which extend across parts of Morocco, northern Algeria and parts of Tunisia, and is dominated by a Mediterranean climate. It has a long history of political and cultural contacts with nations and regions outside of Africa, especially Mediterranean and Southwest Asian cultures. The Atlas Mountain Range also served to facilitate agriculture in the region, as most farming takes place in small valleys sheltered from the harsh winds by the mountains. Farming in this manner is also seen in the alcoves created in the Nile Valley and delta and along the Mediterranean coast. Under the sheltered conditions of valley farming a wide variety crops can be grown including: Cereals, rice and cotton, and woods such as cedar and cork. Along the coast of the Mediterranean, crops such as olives, figs, dates, and citrus fruits are also cultivated. Some North African nomads, such as the Bedouin, choose another system of agricultural cultivation and maintain their traditional pastoral lifestyle on the desert fringe. In moving their herds of sheep, goats, and camels, the Bedouin often cross political borders to find suitable grazing lands. After defining the landscape in the region, the Atlas Mountain range descends southward and transforms into a steppe landscape before meeting the Sahara. The Atlas mountain range is a portion of the fold mountain system that runs throughout parts of Southern Europe. Perhaps the most famous civilization to ever form in North Africa was Carthage, a city that entered the annals of history due to a long and lengthy battle with Ancient Rome. According to myth, Queen Dido was granted land in North Africa to build a civilization for herself and her people, the Phoenicians. The myth states that a local ruler promised Queen Dido all the land that she could cover with a cowhide. Dido was able to devise a clever method of stretching the cowhide, and in that manner gained a large territory for Carthage. The animosity between Carthage and Rome is also traced to myth. Virgil asserts that Dido was rejected by a Trojan prince named Aenas, and the rejection fell hard on the Phoenician princess. Aenas would go on to lay the foundation for Rome, but the division between him and his rejected lover was never healed. Eventually the animosity between the two lovers grew to a deep political animosity between Carthage and Rome. Carthage eventually developed into a commercial power, but was forced to rely on mercenary soldiers to defend its extensive borders. At the height of its power, Carthage reached into Spain and Sicily, a fact that led to the First Punic War with Roman forces. Geographic over-expansion taxed the ability of Carthage's navy and left its borders open to military conquest. Roman military forces took advantage of the exposed Carthaginian borders and succeeded in gaining all former Carthaginian lands over a period of 100 years. As a result of Roman incursions into Carthage territory, North Africa was redefined as a Roman province of Africa in 146 B.C.E. The Roman occupation of Northern Africa led to tension and military conflict between Rome and the African civilization at Numidia (a Berber kingdom once existing in what is modern-day Algeria). The wars with Numidia launched the military careers of many young Romans, including Marius and Sulla. Through repeated military successes the borders of the Roman Empire expanded and Rome was forced to reevaluate the Roman Constitution. Northern Africa continued under the control of the Roman Empire until the early fifth century. In its heyday it produced such remarkable citizens as Augustus of Hippo. The glory of a Roman North Africa did not last however, and a string of incompetent military leaders left the region open to invasion from the Germanic barbarian tribe, the Vandals. In order to breach the Roman defenses, the Vandals crossed the straights of Gibraltar and attacked the Roman army along those vulnerable borders. The invasion by the Vandals led to the loss of all Roman territory in Northern Africa. In losing the land, the Roman Empire lost a pinnacle and vital feature of the empire, as the region had previously been a large exporter of grain. Attempts to regain Northern Africa were frustrated by repeated Vandal victories. When the Huns launched attacks against the Roman Empire proper, Rome was forced to divert its military forces away from the African continent. In the early seventh century, Arabic Muslims arrived in North Africa and began a campaign to subdue the native North African populations. By 670 the campaign had succeeded and most of Northern Africa had fallen to Muslim rule. In response to the threat of Muslim invasion, the Berbers banded together and began to form their own kingdoms. The Berber kingdoms were successful in establishing themselves and maintained autonomy until the Almoravids launched a successful series of jihads in the eleventh century C.E. The jihad movement had the effect of solidifying the position of Islam in Northern Africa. Following the success of the jihads, Islam was able to penetrate into sub-Saharan Africa and establish a stronghold. In the nineteenth century Northern Africa was colonized by France, Great Britain, Spain, and Italy. While all four countries had strongholds in Northern Africa, France controlled the largest portion of territory. Following World War II a nationalistic movement swept across Northern Africa which resulted in all the states gaining independence. The discovery of oil and natural gas reserves in the desert transformed the economies of Algeria and Libya. Oil rigs now dot the landscape in these two nations, with Libyan oil being most prized due to its low sulphur content. The economies of Northern Africa have also revitalized in other areas. For example, phosphates have risen to become one of the largest exports of Morocco. Egypt and Tunisia have taken a different approach to economic sustainability, relying on the tourism industry as a vital component of the country's income. The earliest inhabitants of Northern Africa were the Berbers, an indigenous group that formed the first civilizations in the area in the fifth and fourth centuries B.C.E. Contact with the Berbers was documented by the Egyptians, Abyssinians (Ethiopians), and Nubians who lived in the northeastern portion of the African continent. While the homelands of these groups are not included under the U.N. definition of North Africa, most scholars include them when discussing the history of human occupation in the region. Ethnically, scholars divide Northern Africa into three regions: The Maghreb, the Nile Valley, and the Sahara. 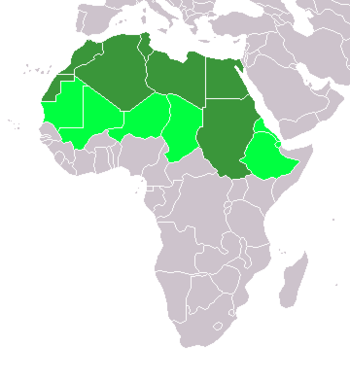 The populations of the Maghreb and the Sahara are closely linked through linguistics, as both groups speak dialects that derive from either the Berber language or Arabic. While it may seem at first glance that Berber and Arabic are very different languages, they actually exhibit many similarities, as both are members of the Afro-Asiatic language family. Besides a linguistic link between the Maghreb and the Sahara, the populations are also connected along ethnic lines. Ethnic lines are often blurred in the Maghreb, where both the Arabic and the Berber cultures exercise a strong influence. It is common for Berber and Arabic individuals in Northern Africa to identify with the opposite culture due to social and political circumstances. The Berber cultural identity underwent a revival in the twentieth century and they campaigned to maintain a distinct cultural identity. While Northern Africa is predominantly Muslim, a small Jewish population also existed in the region prior to decolonization. When many countries in Northern Africa gained independence, much of the existing Jewish community emigrated to France. The formation of the nation of Israel also contributed to the mass emigration of the Northern African Jewish population. Today, the Jewish population in the region numbers less than fifteen thousand, almost all of which are centered in Morocco and Tunisia. Encyclopedia Britannica. North Africa. Retrieved July 25, 2007. North Africa. The North Africa Journal. This page was last modified on 12 December 2018, at 17:38.